Nobody enjoys discovering a pest problem in their house. The crunch of a cockroach under your feet, the sight of a spider gently falling from the ceiling, or finding small red bumps on your skin early in the morning because of bed bugs. All these can be a sign of a bigger pest infestation and not to mention an unwelcoming surprise. 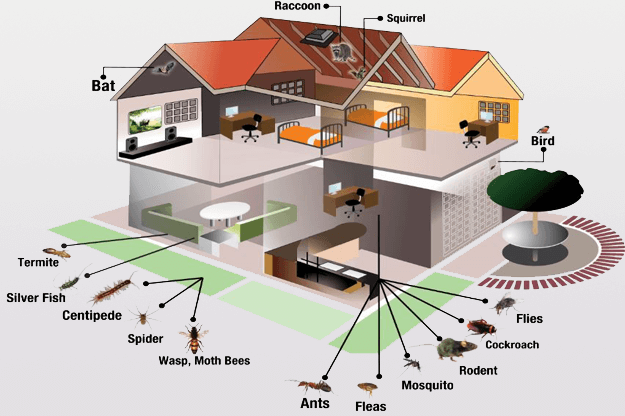 Our residential pest control services focus on restoring your property to the safe and comfortable home environment you crave so much. Our pest exterminators are experts at eliminating bed bugs, roaches, spiders, fleas, mice, rats and other home pests, making sure they never return. We cover all ZIP codes in Des Plaines, Park Ridge, Elk Grove Village and Niles. When you have a pest problem, you want it solved right away. We offer a variety of custom-designed pest control programs that bring immediate relief and ensure stress-free, long-term protection. Each service starts with a detailed inspection of your home to determine the severity of the pest infestation and implement the most effective pest treatment plan. Our pest extermination services are not hourly based and we leave your home once the job is completely finished. We provide instructions for each treatment with the necessary number of scheduled visits. And if you book our guaranteed service, you benefit from extra follow-up visits free of charge, within a period of 3 months after the initial treatment for your specific pest problem. But that’s not all! Take advantage of our special deals if you are a return client! © 2016 - 2019. All Pests Gone. All Rights Reserved.